Yes in some tests (like 3dmark physics) it is very obvious the quad A15 aren't running anywhere close to their max frequency. This is not surprising last time I looked at some power draw figures just two A15 cores at max frequency alone (so without graphics) could already exceed the power budget of the whole chip. These SOC GPU's are rapidly catching up to PC GPU's. They aren't there yet, but they've made impressive strides in just a few short years. 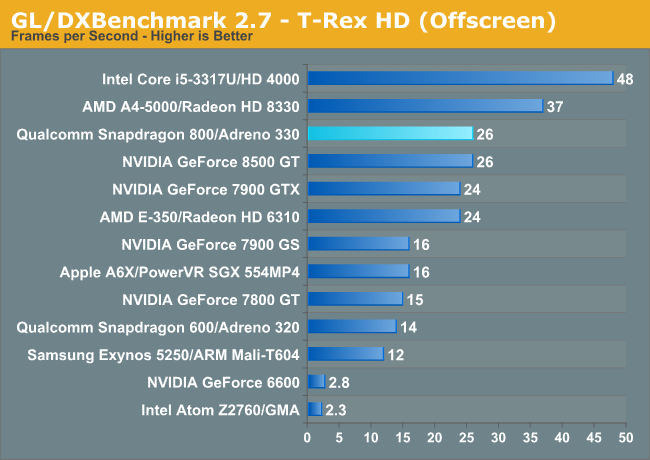 This looks great - but frankly I need to see this vs Tegra 4 and A7. 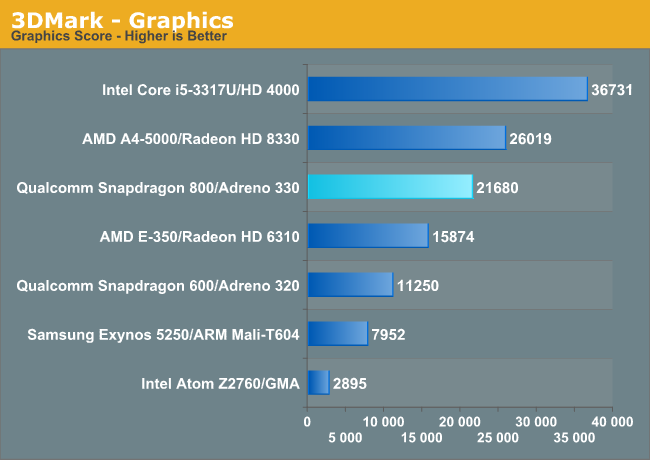 Also - I agree we need to see vs HD5000/HD5200 Haswell. 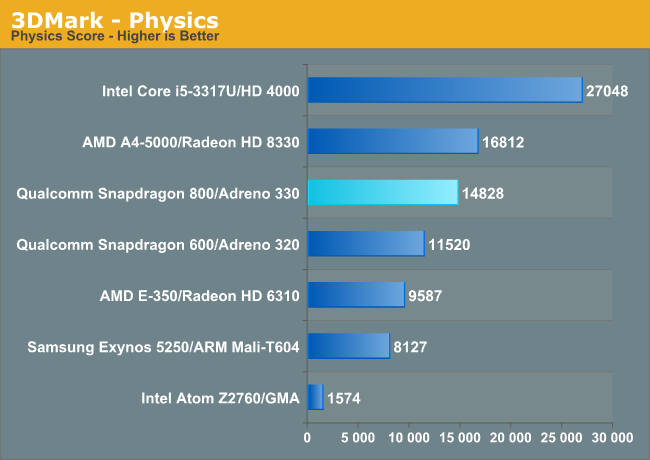 Tegra 4 is probably a toss up performance wise - and will come down to power (which Qualcom normally wins). Kinda makes me sorry I pre-ordered a Shield when this will be in the Note 3 and I could just attach a controller. Hopefully Nvidia can do a better job of getting AAA games to actually support Shield. I'm sick of all the blockbusters being iOS only (or 6 months early). 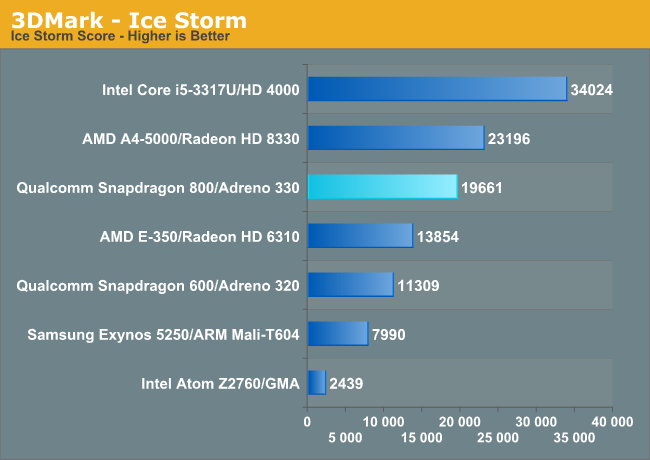 Apple seems to double performance every year, and with PowerVR 6 - you could get a bigger bump. That would easily surpass this. If AAPL would just come out with a larger screen, I'd go back to iOS this time around. And IF we see Haswell tablets with 7-9 hours of battery life - I'm not sure all of this stuff doesn't get relegated to the dust bin of history with Intel taking 90%+ of the tablet/hybrid market. I'll be interested to see how the actively-cooled Tegra 4 in Shield performs compared to the standard passively-cooled stuff. I'd suspect that if you're going to be gaming for a while, the Shield may pull away. Tablets and smartphones these days aren't designed to run at full tilt all the time. "Intel taking 90% of the tablet/hybrid market"